Hatters midfielder Pelly-Ruddock Mpanzu admitted he would vote for Aston Villa’s John McGinn stunning volley in tonight’s EFL Goal of the Year category. 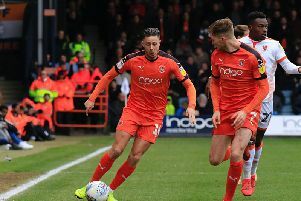 The 25-year-old is in the running for the award, won by Town’s Olly Lee last season, along with McGinn, Lewis Page (Charlton Athletic), Adam Reach (Sheffield Wednesday) and Ruben Neves (Wolves). Mpanzu will be at the awards along with James Collins, Jack Stacey and James Justin, with Collins up for the EFL League One Player of the Season and Justin in the running for the EFL Young Player pf the Year award. The winner will be chosen this evening, as speaking about the award, Mpanzu said: “It’s good to get voted for anything, especially goal of the year.